Writing is never as hard as a writer shows it to be. But, it is not as easy and effortless as others think it is. Writing what you have in your mind is one of the most difficult things to do. The words must flow; the expressions must come the right way; the soul must remain intact over the edit iterations; the edits must contribute to the quality; and, the sequences must fall in place until the conclusion. If only all this was were so easy! That’s why writing about writing makes even more sense. For most of us, the focus is on the sellability of the content. But, we forget to check whether the content helps relieve the pains of the readers. Does the content bring any value to the readers? Does the content make the readers’ lives better? Does the content reduce their troubles? The Write Stride: A Conversation with Your Writing Self is an attempt to address such issues in writing. The book is a collection of the writing methodologies that I have designed to help me write clearly. And, I hope that they help you, too, do the same. To find out more about the methodologies, read the book. 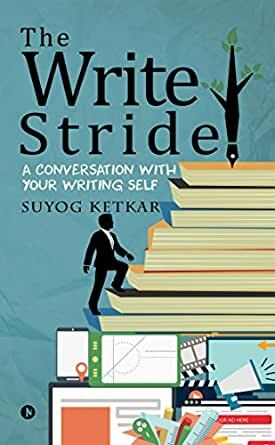 Suyog Ketkar has documented his learning experiences with vivid details from his Technical Writing career. He has jotted down his interactions with his "Technical Writing Self" in lucid terms. I believe this book should be useful for every aspiring Technical Writer.